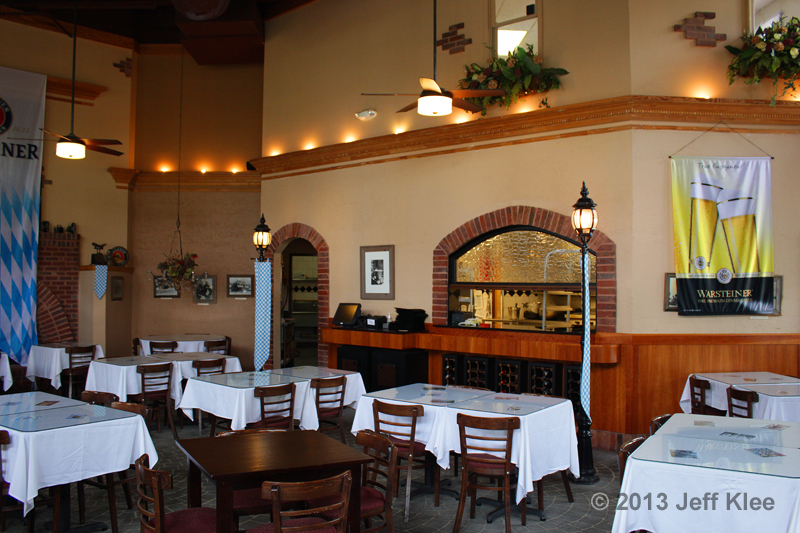 Located just south of the Fayetteville square, on Glynn Street, the café sits on a quiet corner next to Beauregard Blvd. The parking lot is generally ample, but during busier times it can easily fill up. If you arrive during the lunch or dinner hours and the parking spaces are full, you can park in the grass and dirt areas as long as you leave room for others to drive past and get their cars out of the parking spaces. Walking up to the door, you first come across one of the outside eating areas. At the time of my visit, this is where they were running events related to their Oktoberfest celebration. 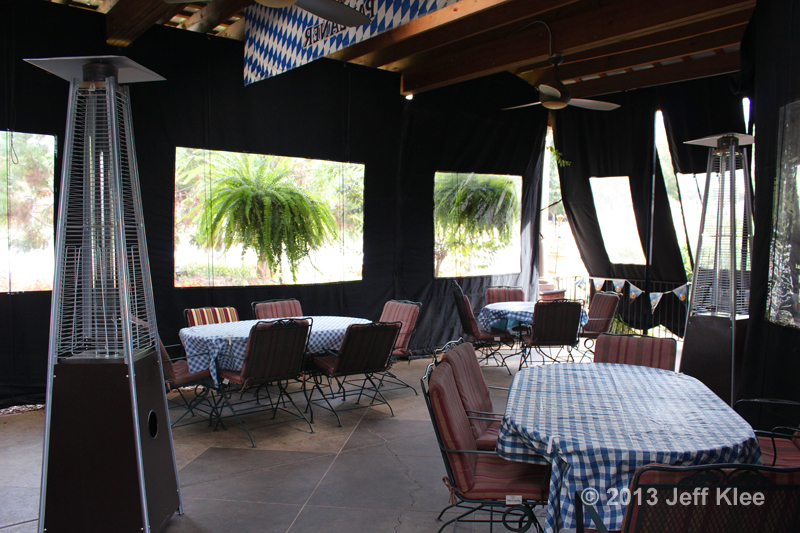 As of the time of this posting, Oktoberfest will be over, but next year you can expect detailed reviews on what to expect for events and changes in the menu. Tower heaters provide warmth during the cooler autumn nights. 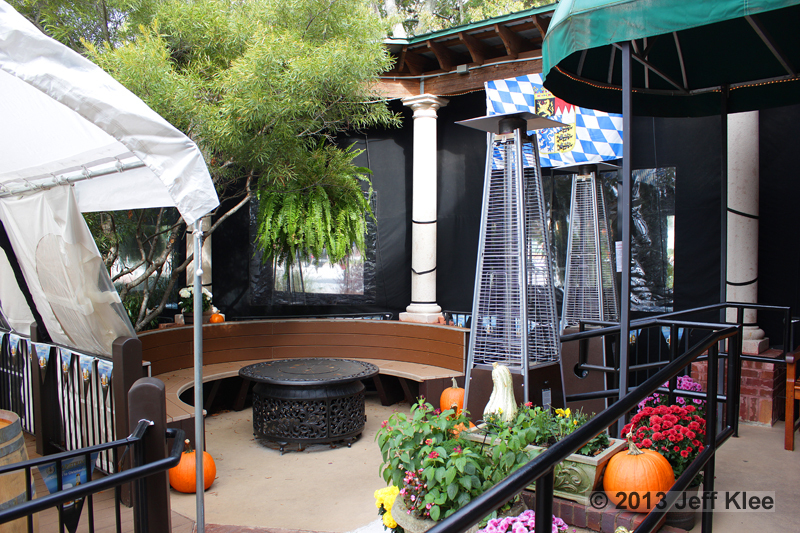 This area was a temporary setup for the Oktoberfest events. 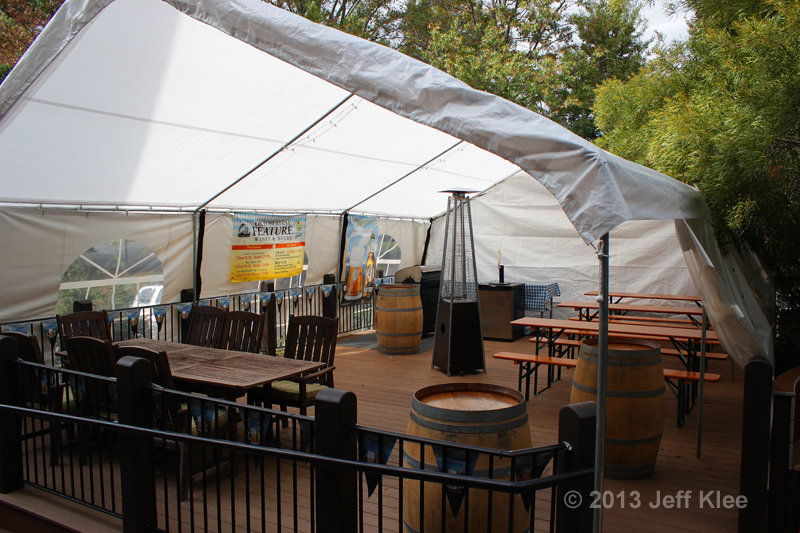 Once over, the space was cleared out and the tent and heaters removed. This left an empty, exposed deck ready for the next big event. A curved bench wraps around a small fire pit in this peaceful sitting area. The larger outdoor seating area below has the ability to be completely enclosed, and also has tower heaters positioned throughout. Ceiling fans provide a gentle breeze during Georgia’s warmer seasons. Several times during the day you may find these outside seating areas necessary, as the restaurant has minimal seating inside, especially considering its popularity in the community. 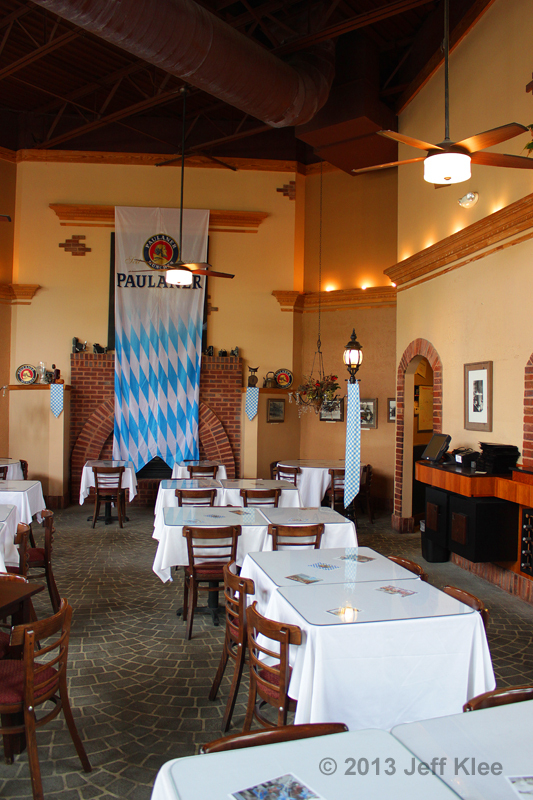 Stepping inside, you’ll feel as if you just walked into a quaint, German neighborhood. Designed with a stone street, street lamps, and aging stone over brick building facades, the room brings the outside in. One of the “buildings” is actually the kitchen. 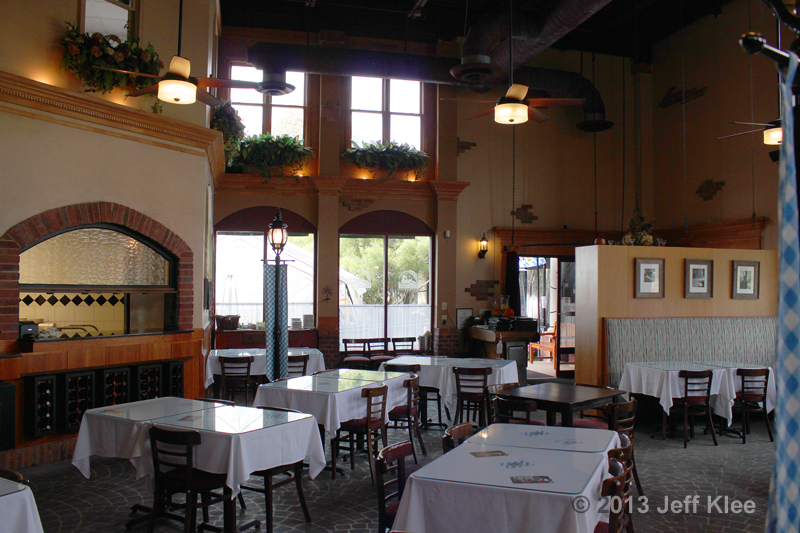 A quick peek through the brick archway that frames the window, and you can catch the chefs preparing your meal. Looking towards the entrance, large windows open the wall from floor to ceiling to allow natural light to enter the main dining room. The restaurant has 360 degree views of this “outside” cityscape. Behind the counter, along the wall, is a cutout that looks like a brick lined hearth. 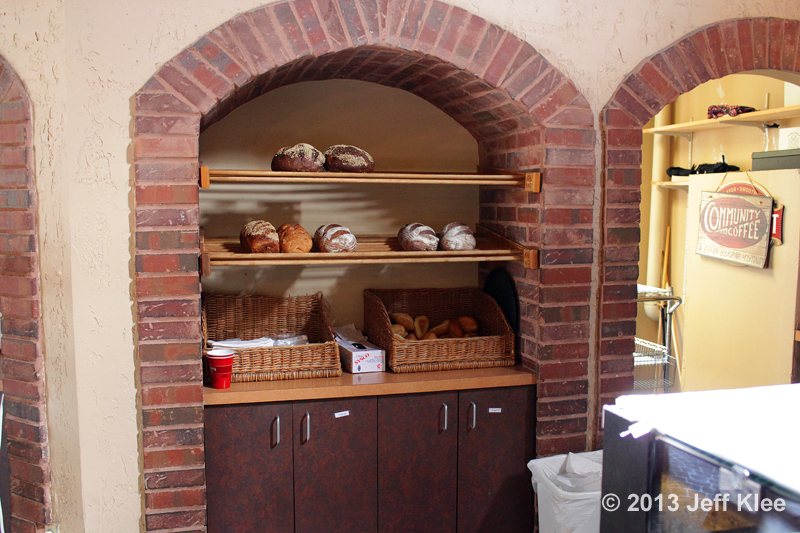 Inside are wooden racks that are used to display the day’s fresh baked bread. 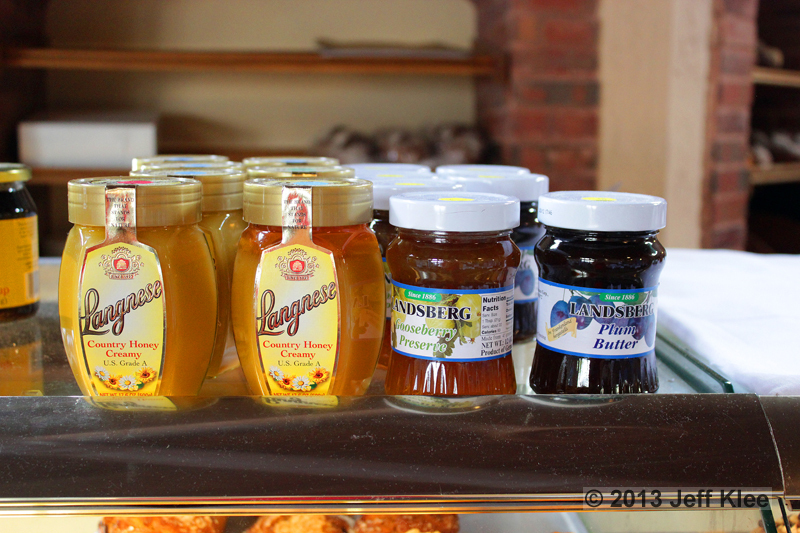 On top of the bakery case City Cafe displays their selection of honey and preserves that are for sale to the customers. More details on these quick glances will appear in future articles, but for now it’s time to get to the best part, the food. Today I’m enjoying my first real meal here, as opposed to just sampling bakery items. 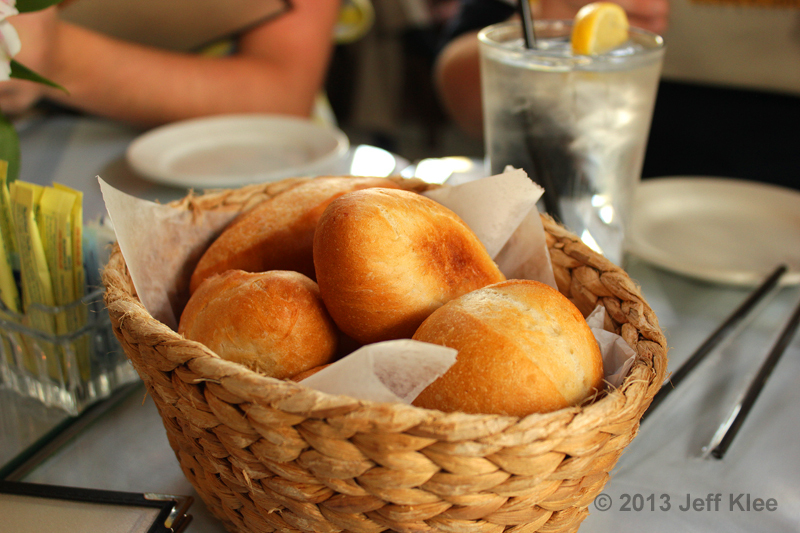 The first item brought out is a bread basket of sourdough rolls. Being in a bakery, there may have been a slight disappointment in these basic rolls. I’m sure they have the means to offer some very unique breads. 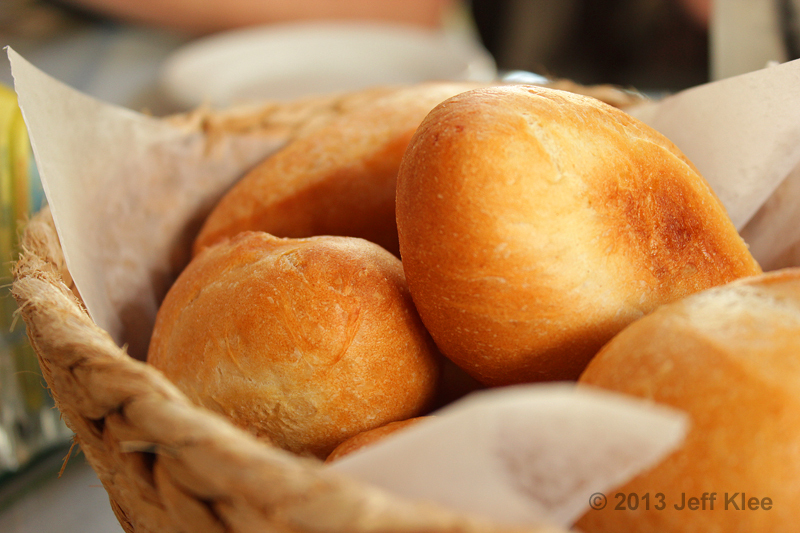 At the same time, I have no complaints on the quality of these simple rolls. The outside was firm, but not crunchy. The inside was as soft as one would hope. The only issue was that the standard knives we had to cut the rolls were not very effective since the bread would bend with the pressure from the knife, rather than slice open. There really is no fix for this other than making the outside a bit crunchier, which in my opinion compromises quality, or offer sharper knives to cut the bread. For my first City Cafe meal I decided to start with sandwiches. To make the decision process easy, I started at the top of each section and picked the first cold sandwich and the first hot sandwich. 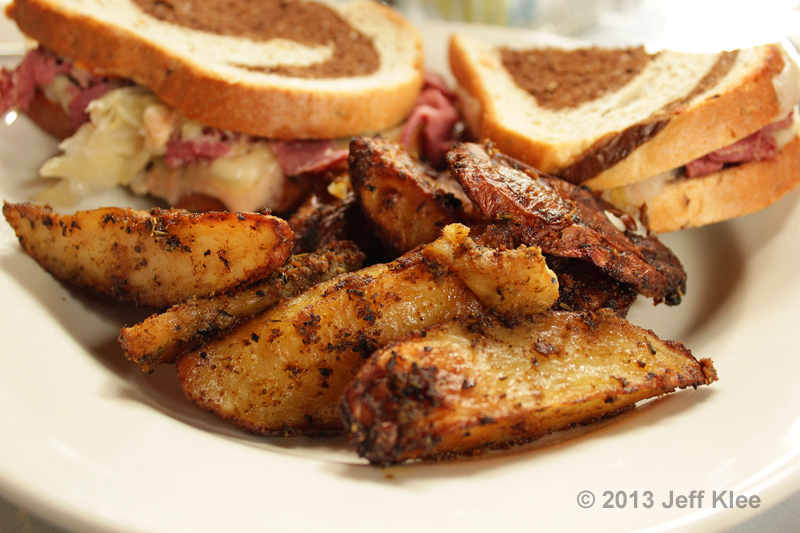 This is the Classic New York Reuben, which comes with a side of roasted potatoes. Nowhere on the menu does it mention any sides with the sandwiches, so these potatoes were a bit of a surprise. I can thankfully say they were a positive surprise. The potatoes appeared to have been pan fried in butter. They had a strong butter flavor, and were heavily salted. There was an herb mix that was covering the potatoes, and in some spots, this herb solution created an almost breading-like covering. They were cooked well. The edges were crisped from being fried, and the insides were tender, but not mushy. The flavor from the herbs was excellent, but I think they could have sufficed with just a little less salt. It wasn’t enough to make them displeasing, but that would be my only opinion for an improvement. 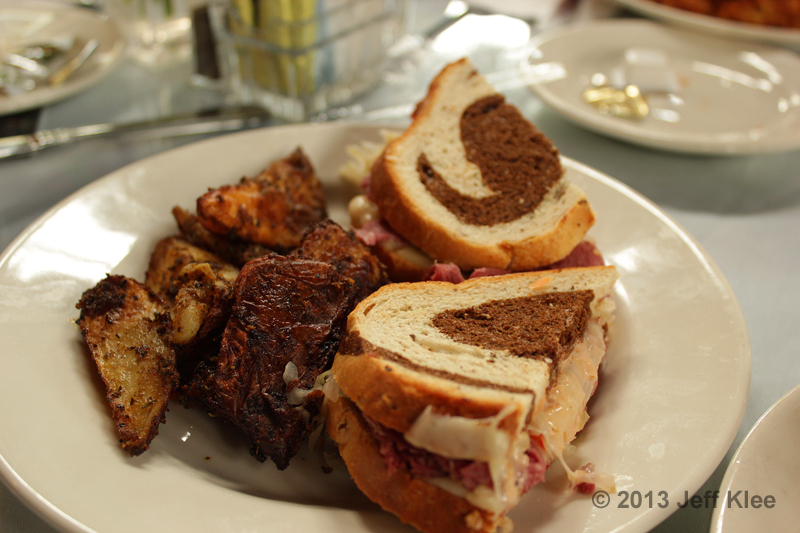 The Classic New York Reuben was wrapped in marbled rye. 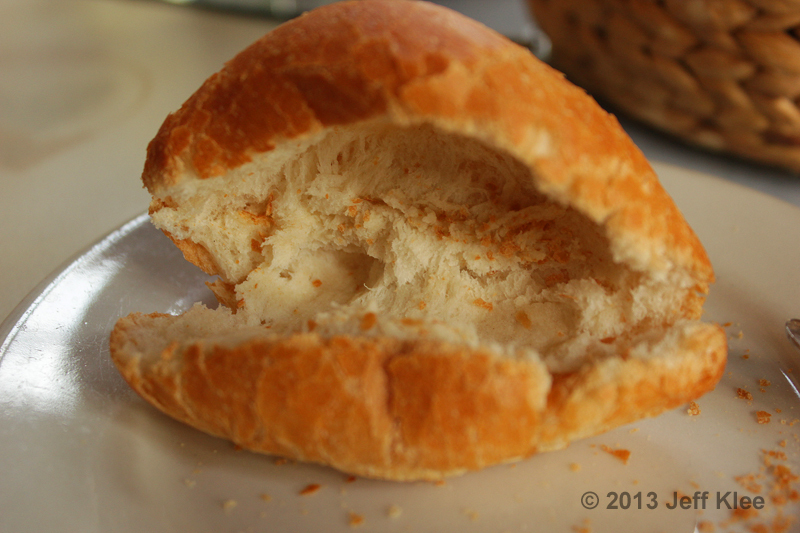 As expected, the bread was fresh baked in-house that morning. 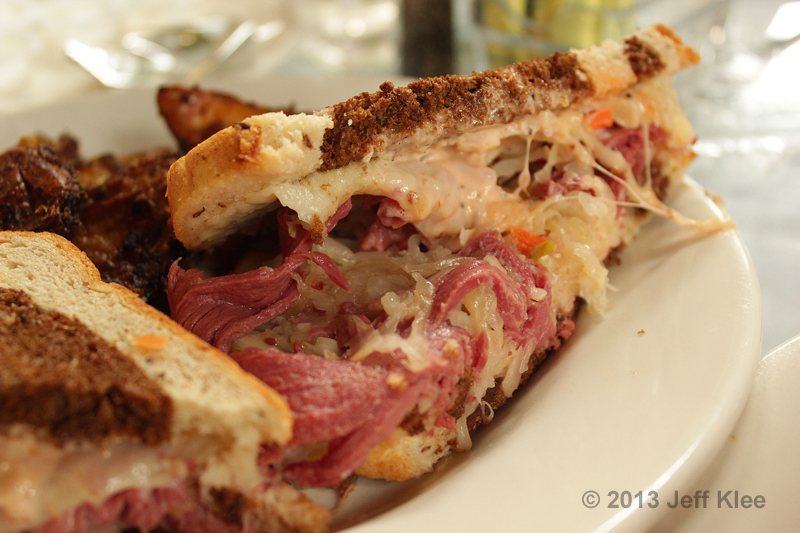 Inside, the usual suspects included corned beef, Swiss cheese, sauerkraut, and thousand island dressing. The meat was hot, and the melted cheese draped over the side of the sandwich. 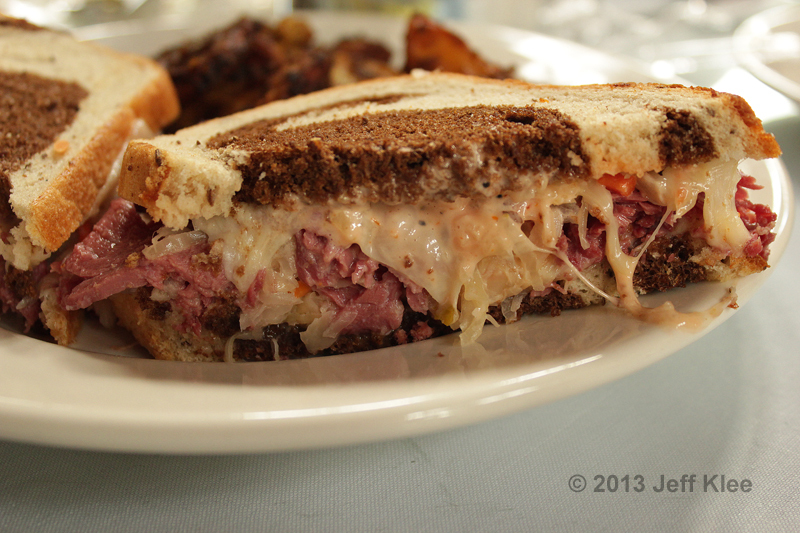 The Reuben was decently packed with ingredients. It wasn’t a very thick sandwich, but there was more than enough to taste more than just bread. The corned beef was supple and lacking any impurities to make it chewy or hard to bite. One last ingredient, that can barely be seen here, were carrot shreds. I couldn’t tell if they were part of the sauerkraut, or just an addition to the sandwich. As with many hot sandwiches, it was a great meal. Everything tasted fresh, and while there was nothing unique about this old classic, I have nothing negative to report. It was a satisfying amount of food, with quality ingredients for a reasonable $7.95. 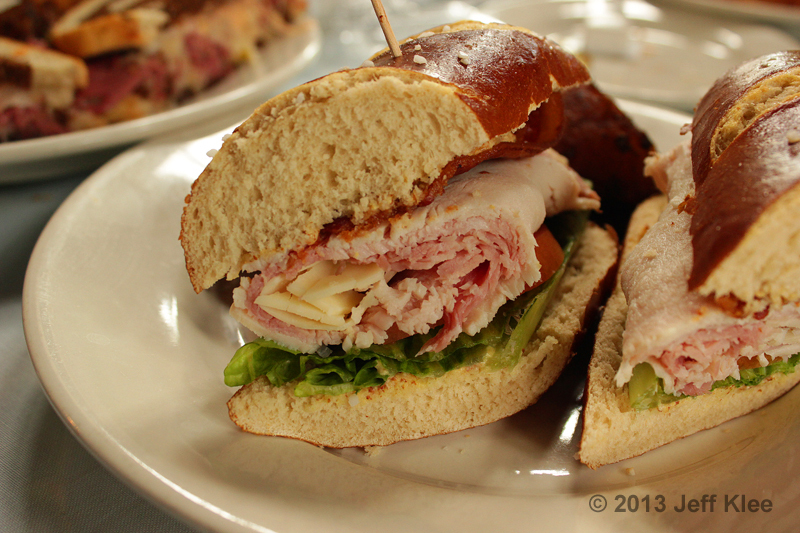 The first cold sandwich on the menu was the Cafe Club. This plate also came with a side of the same roasted potatoes. As the menu states, all their sandwiches are made using Boar’s Head meat, which is known to be a slightly healthier, and expressly higher quality deli meat. 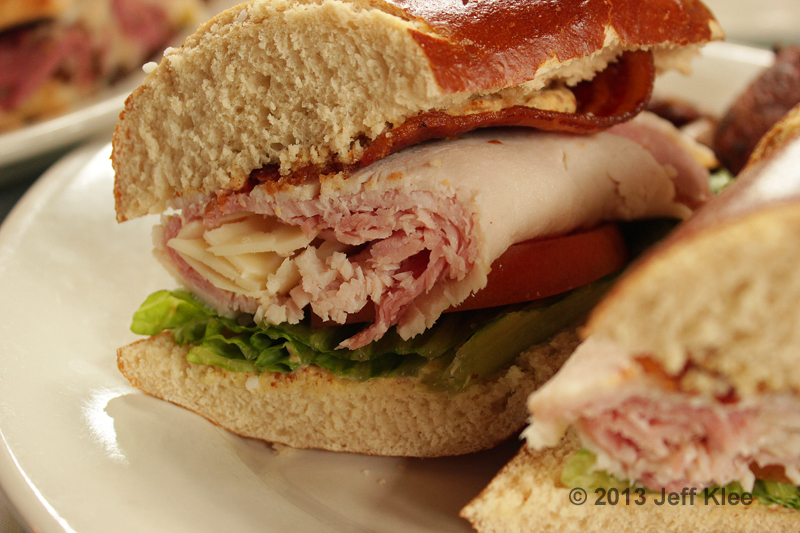 The sandwich is comprised of turkey and ham, provolone cheese, bacon, lettuce, tomato, and mustard. The ingredients themselves were not unusual, but the key here is again, fresh, quality food. The tomato was juicy, the lettuce was crispy and not wilted, and the bacon was fully cooked, also adding some crunch to the soft sandwich. The one change from what I’m accustomed to was the bun. This was my first ever tasting of a pretzel bun. I had no idea what to expect, but it was a delightful experience. The bun was soft, and it tasted exactly like, get this, a soft pretzel! It really was a fantastic alternative to the one consistency of every sandwich I’ve ever had in my life. There were large crystals of salt on the bun, just like any pretzel you can pick up at your mall food court or amusement park. The salt and mustard were standout punches against the more mellow meat, cheese, and vegetable elements. This $7.95 sandwich would have been average, but the bun brought it up a notch or two. 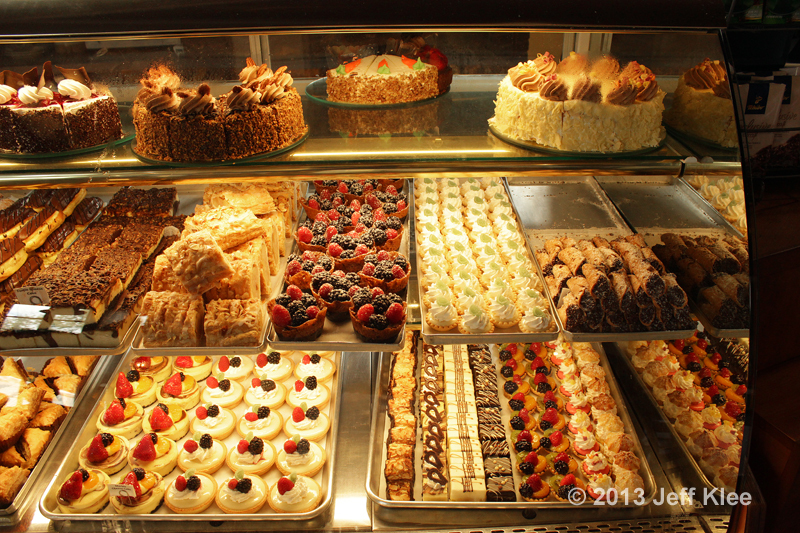 When it comes time for dessert, you need to walk over to their bakery case to make your choice. The case changes daily, making it difficult to have a printed menu. They do have a To Go menu that has many of the common items, but if you’re already in the restaurant eating, it’s best to take a look for yourself. The choices can be overwhelming. Luckily for me, I plan on eventually trying everything, so I wasn’t worried about missing something good. You can see for yourself what this day’s offerings consisted of, but I’ll mention the highlights. You can purchase that amazing pretzel bread to take home. The chocolate croissants are said to be really good. I suppose I’ll find out soon. Their cookies are also said to be fantastic. 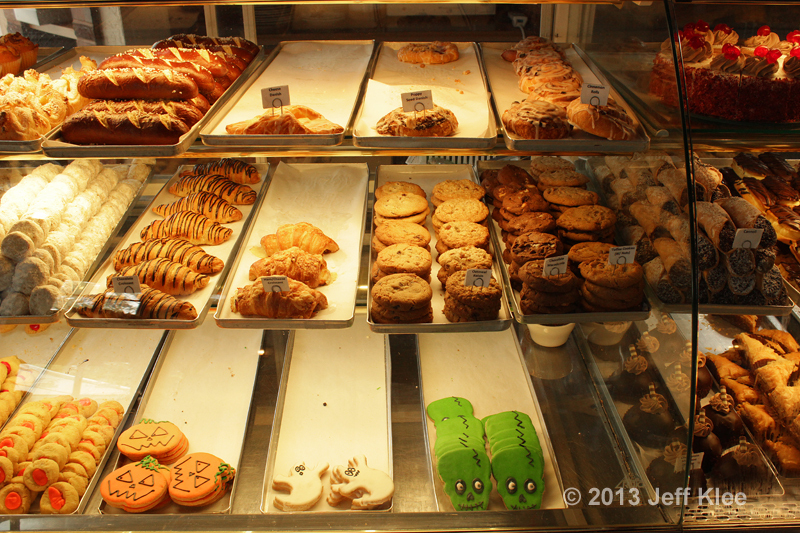 Being October, there were also some Halloween themed cookies available. 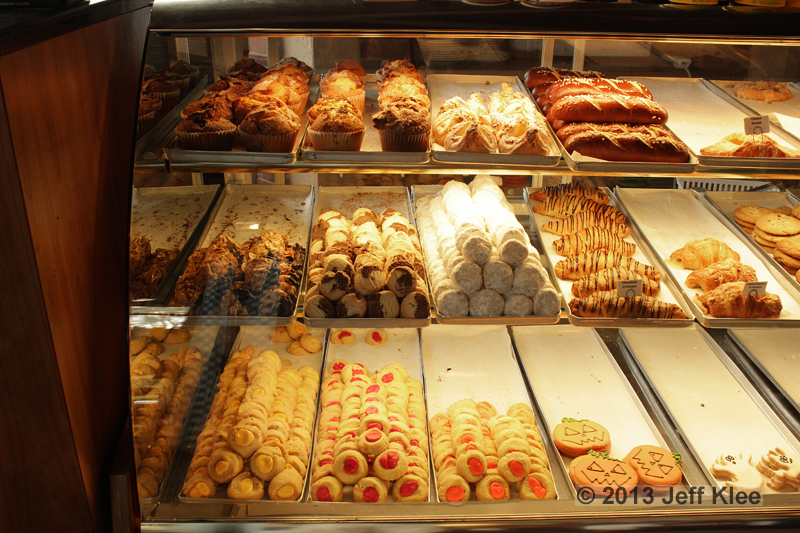 This is where we get into more of the “dessert” items, as opposed to just bakery snacks. 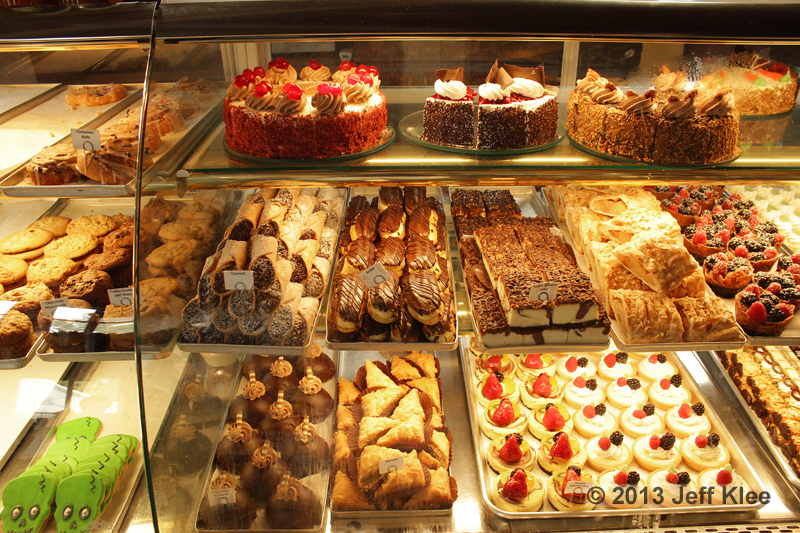 Cakes, cannoli, eclairs, and tarts. 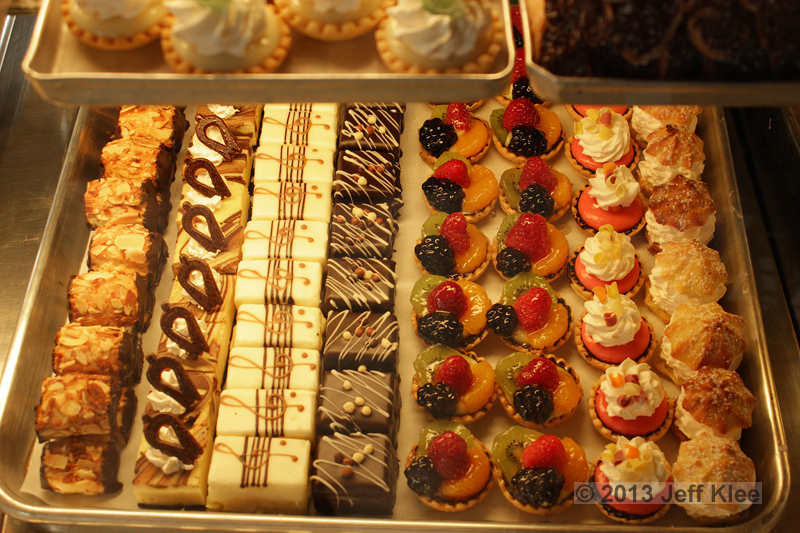 Finally, several mini-desserts of their larger counterparts that we just saw. 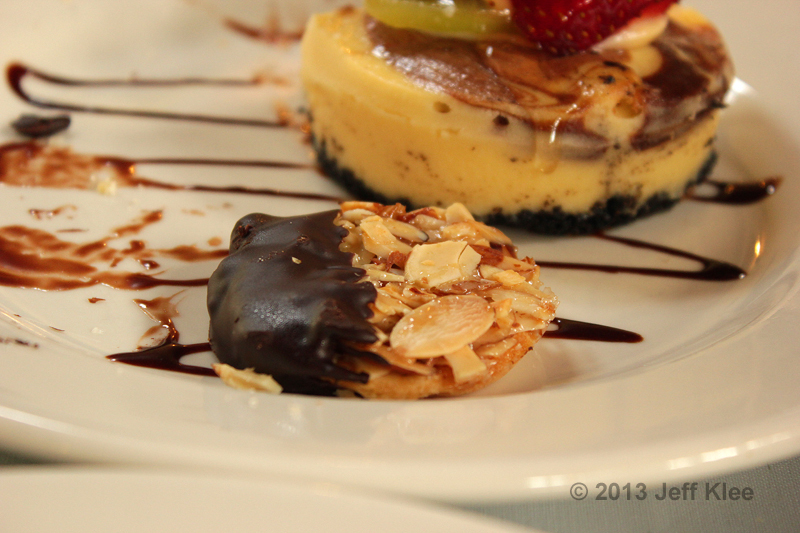 Here is a closeup of those mini-desserts. 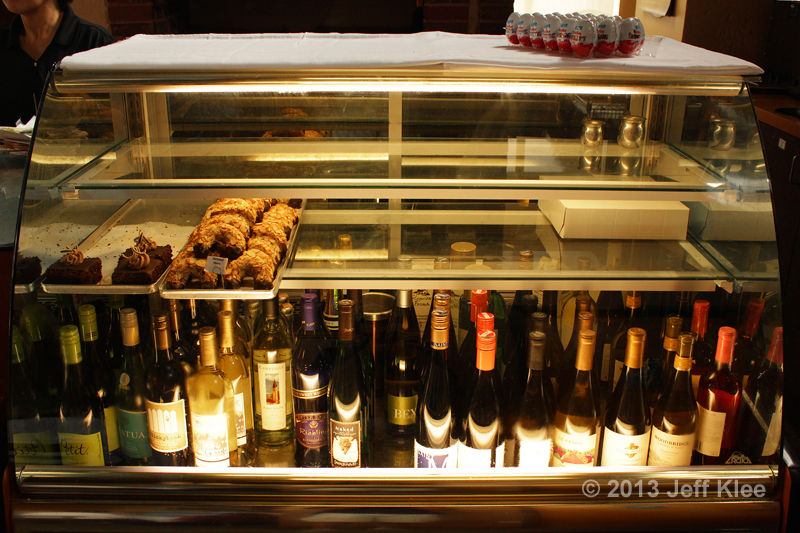 There is another case to the right of the register that houses their wines, and a couple extra treats that wouldn’t fit in the other case. I picked three things today. 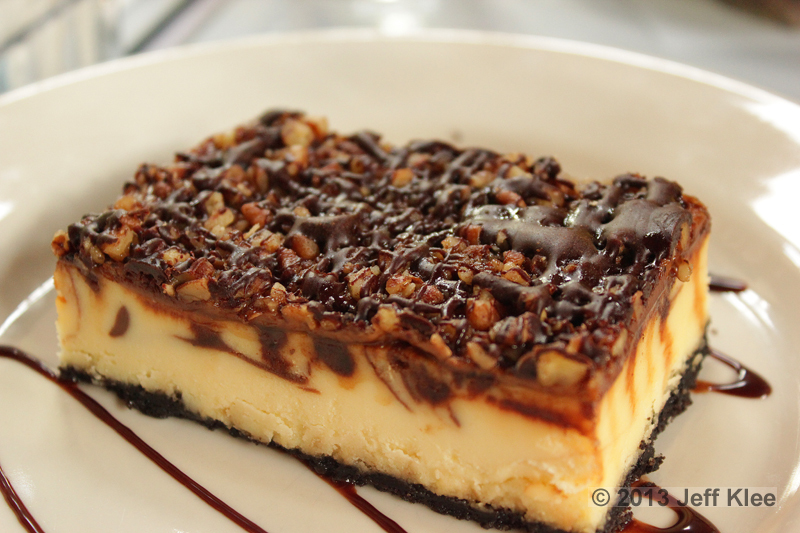 The first was a Turtle Cheesecake. 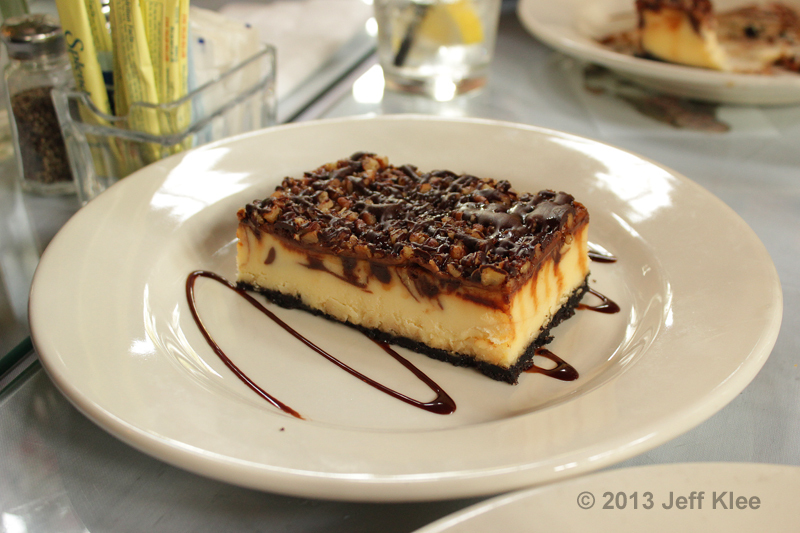 This $3.95 dessert is a square slice of cheesecake sitting on top of an Oreo® crumb crust, with a “turtle” topping. The cookie crust had a formidable chocolate taste, and as thin as the crust was, the taste pushed through all the other ingredients. The cheesecake appeared to be a standard flavor. The texture was just about ideal, right in the middle of creamy and crumbly. On top was where the magic happened. A thin base layer of caramel carpeted the cheesecake, and on it sat a mixture of diced walnuts, additional caramel drizzle, and a lavish amount of chocolate. The chocolate was not just a sauce drizzled over the top, it had hardened from refrigeration. It was a slightly firmer texture than fudge. Many times, I try various desserts that have some sort of flavored topping that’s so minimal, it hardly is noticeable and doesn’t offer anything to the flavor of the food. In this dessert, the topping is again very thin compared to the much thicker piece of cheesecake, and so is the cookie base. However, both these thin layers offered a superb punch that I could easily taste, and each offered their share of the overall flavor to this wonderfully sweet dessert. 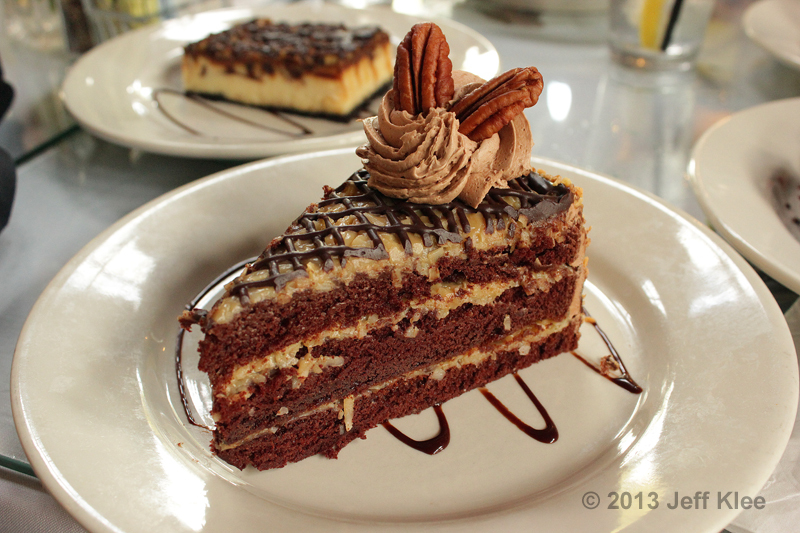 My next choice was the $3.95 German Chocolate Cake. 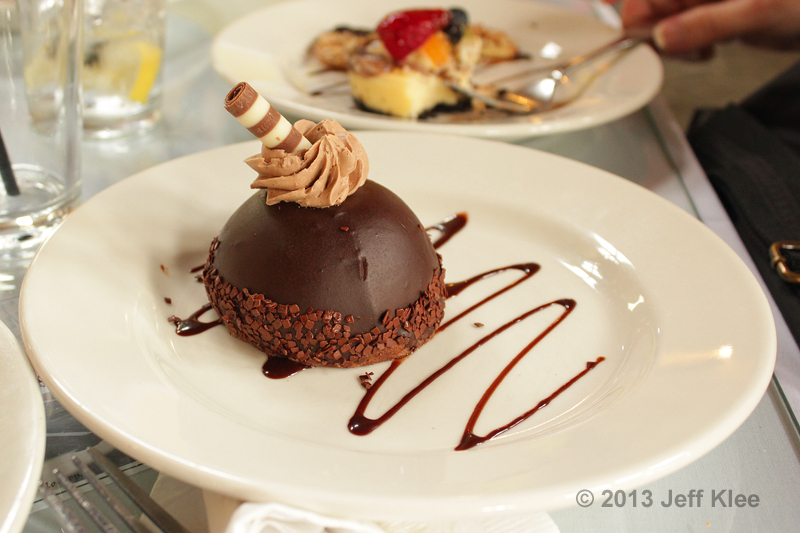 Like all desserts eaten in the restaurant, they decorate the plate with a chocolate sauce squiggle. Topping the cake slice is a dollop of chocolate mousse. The mousse had a full chocolate taste, and had a smooth, soft consistency. 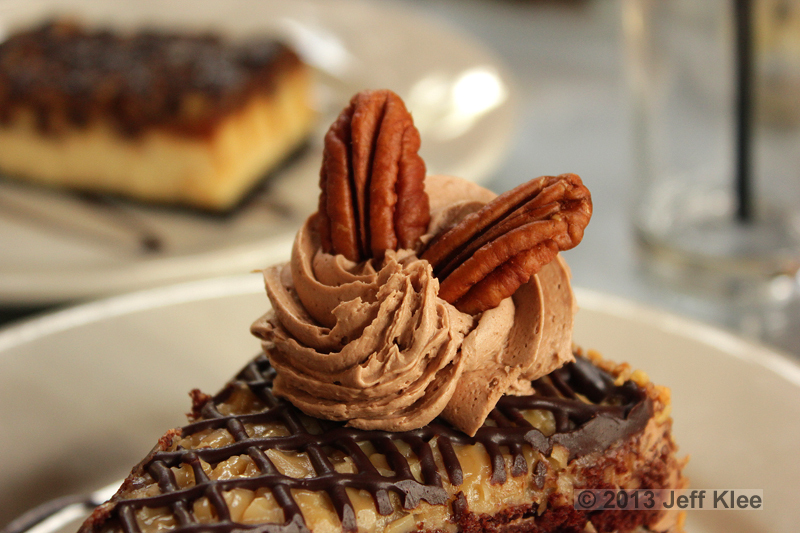 Two pecans were sprouting from the swirl of chocolate. The cake was built in the common layers, starting with the upper level being a crisscrossed layer of smooth chocolate over a coconut caramel frosting. The three cake layers were very moist, and had a light chocolate taste. The second cake layer appeared to be sitting on a thin, denser fudge layer. It was so minimal however, I couldn’t tell if it was actually a different ingredient, or if the cake layer was just a little more dense right in that spot. One surprise hit that makes this cake differ from the others I’ve had is the unique outer layer. The cake had a typical layer of chocolate icing around the outside. Over that icing layer, was a full coating of minced, candied pecans. There are so many fantastic aspects to this extra ingredient. First, the added sweetness provided by the sugary coating surrounding each one. 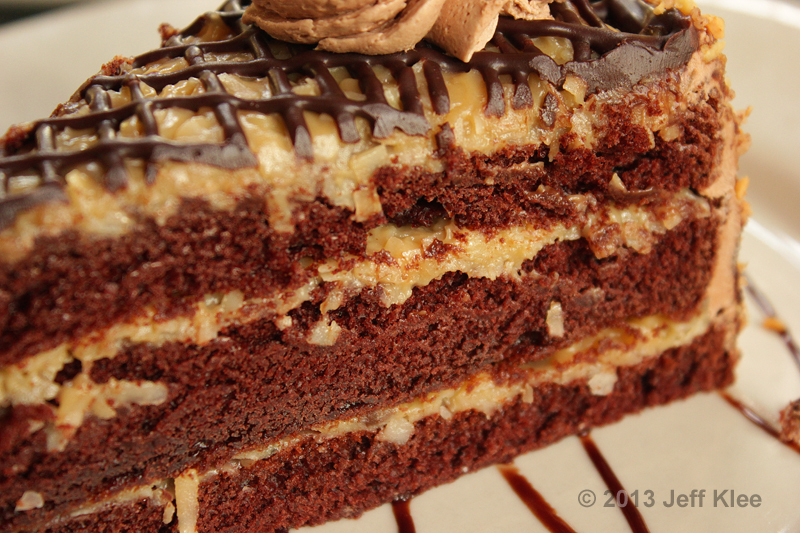 The extra crunchiness provided by the nuts and their candy coating was a complete contrast to the rest of the entire slice, which was nothing but fluffy cake layers, held together with smooth, creamy coconut caramel icing. 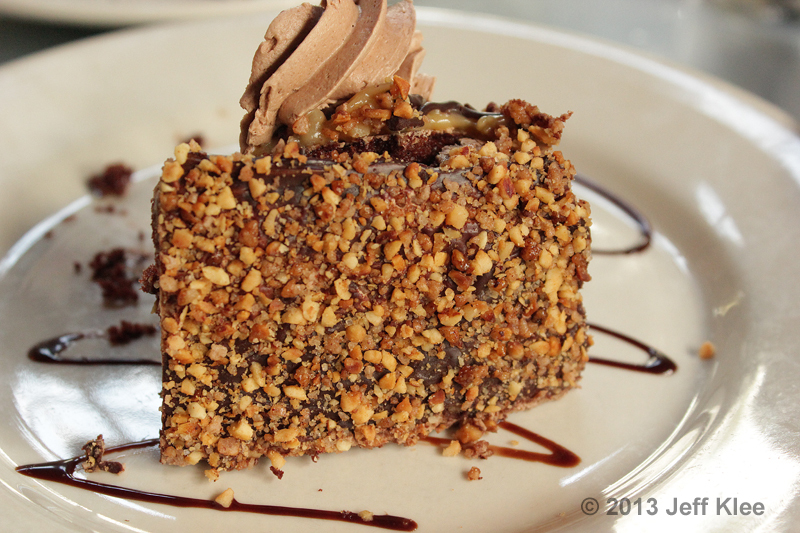 I usually dislike nuts on dessert foods, but with the way these were prepared, I thought it was a great touch, and made this cake slice stand out from any other I’ve tried in the past. 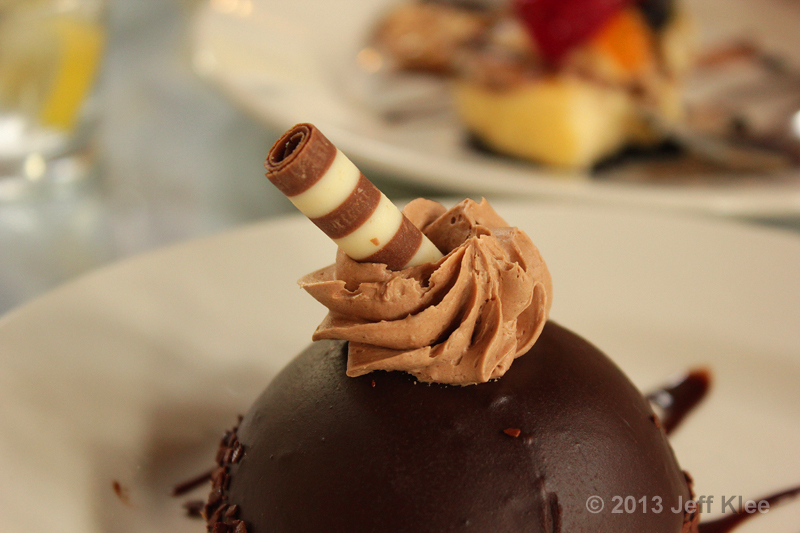 My last choice was a Chocolate Mousse Dome. This dome, also $3.95, was about the size of a baseball that had been cut in half. The dome included the same dab of mousse on top that I found on the cake slice. In this case, instead of pecans, I found a more preferable alternating white and milk chocolate cigarello. I found this one had a robust chocolate taste that I really enjoyed. I would order this garnish on its own if they had them in the case. 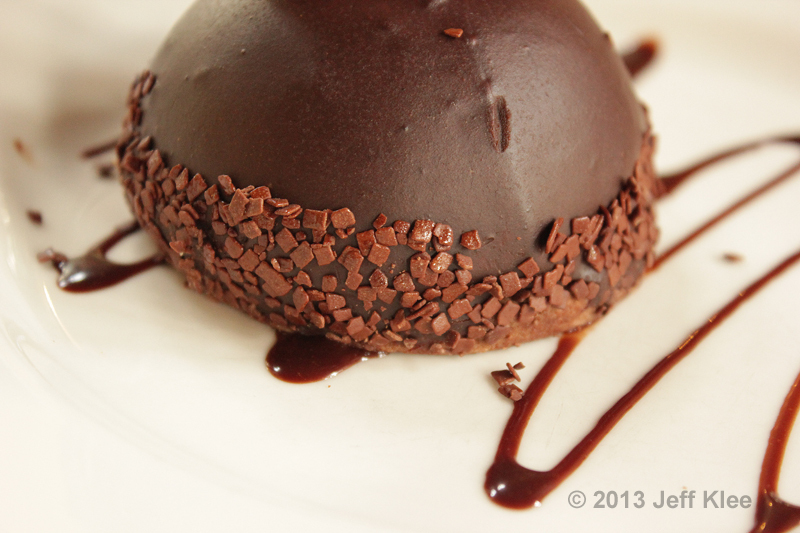 The dome is completely encased in a very thin, but rich layer of chocolate. At the very bottom was a hefty sprinkling of lighter milk chocolate confetti. These had a sweeter taste compared to the slightly more bitter dark chocolate surrounding the dome. 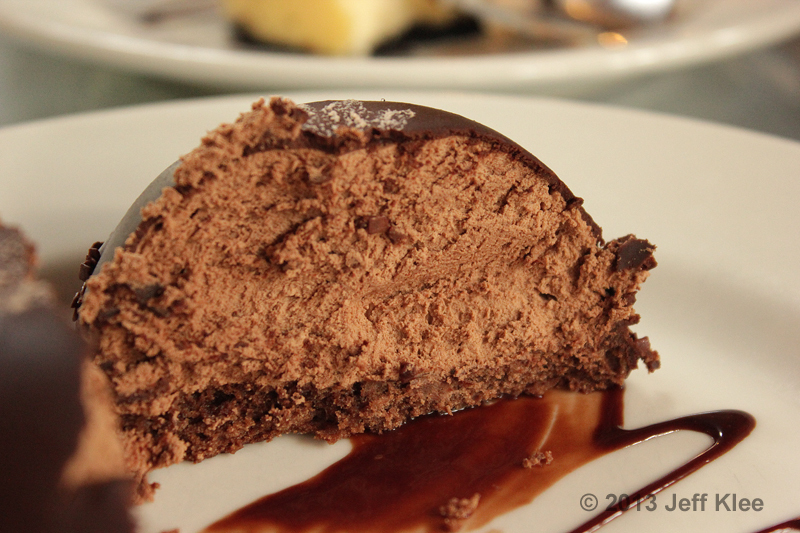 Inside, the dome is filled with a chocolate mousse. This mousse tasted different than the mousse that I found atop the dome and cake slice. It was still sweet, but not as much so, and had a lighter, less bold flavor. It also felt lighter, as in less dense than what was on top. All this was sitting on top of an also light tasting, chocolate short bread base. I would have preferred a richer substance, such as fudge for the base. Because of the lighter texture and flavor, I felt it was lost within the other stronger flavors in the dome. The dome looked like it could be a real winner to this chocoholic. Instead I found a mousse filling that was too light tasting, and a bread base that was too dry when compared to the rest of the dessert. The chocolate encasement with confetti and cigarello garnish were the highlights, but they were too small in quantity to stand up to the amount of filling inside. I think there was room for improvement here, but with many more treats available, I have too many other choices to worry about this one. My wife ordered a couple different items for herself. I had a chance to try a couple bites of each, and every bite counts when trying to taste everything that City Cafe has to offer. She got a plate with a marble cheesecake (about the size of a tart), and a couple of chocolate almond cookies (one was already eaten by the time I started getting photos). 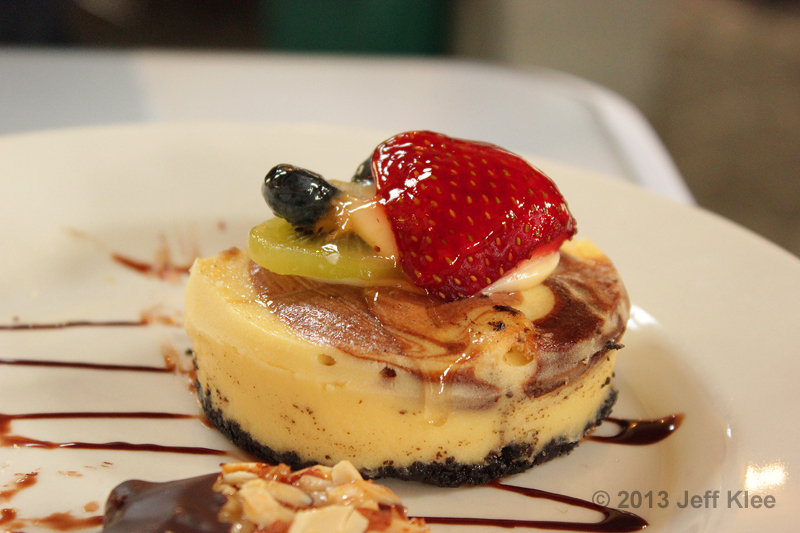 The marble cheesecake was the same cheesecake I had for my dessert, including the Oreo® cookie base. 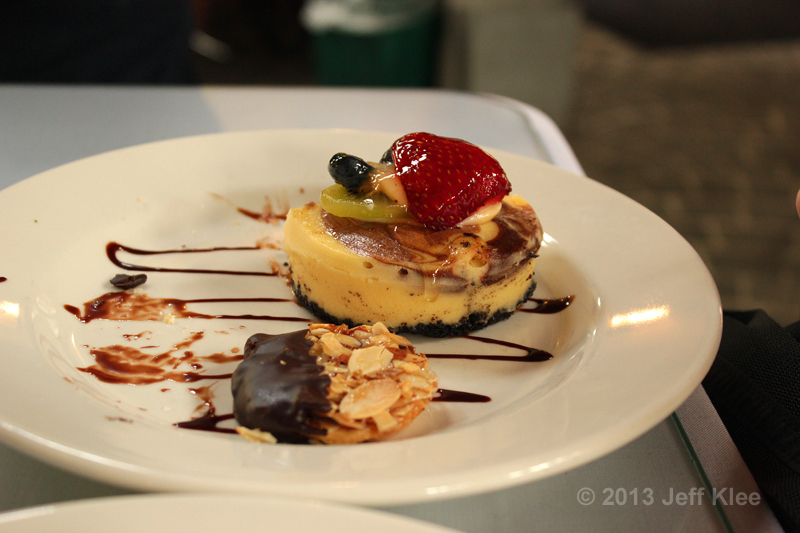 Instead of the turtle toppings, this one had a light chocolate marbling and fruit on top. The fruit was fresh, and the clear gel you see covering it was a simple sugar glaze that protects the fruit and keeps it fresh longer. I thought this $2.50 dessert was not up to the standards of City Cafe compared to my experiences in the past. The cheesecake stood fine on its own, but the glaze on the fruit gave it more of a “previously frozen” taste. Overall, it had a seemingly boring flavor. 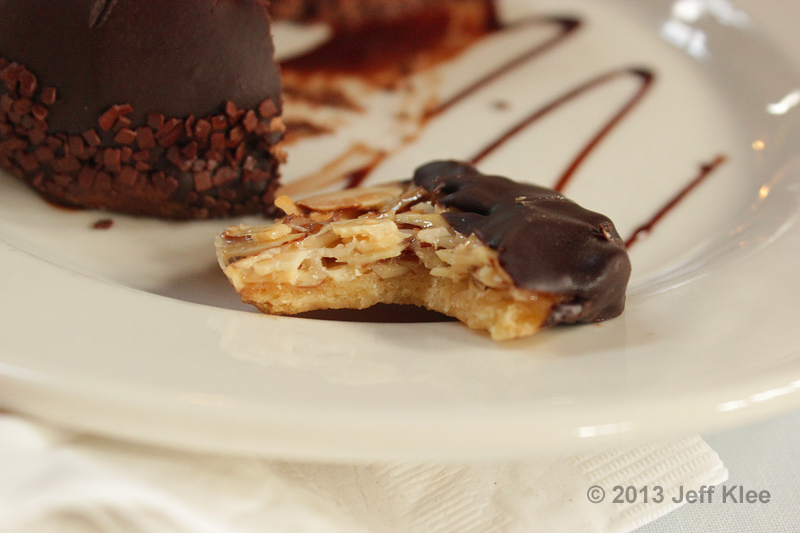 The almond cookies had a shortbread cookie base, which is then coated in honey and covered with sliced almonds. One side is then dipped in dark chocolate. Biting into the cookie, there was a pleasant sweetness, with an obviously nutty overtone. 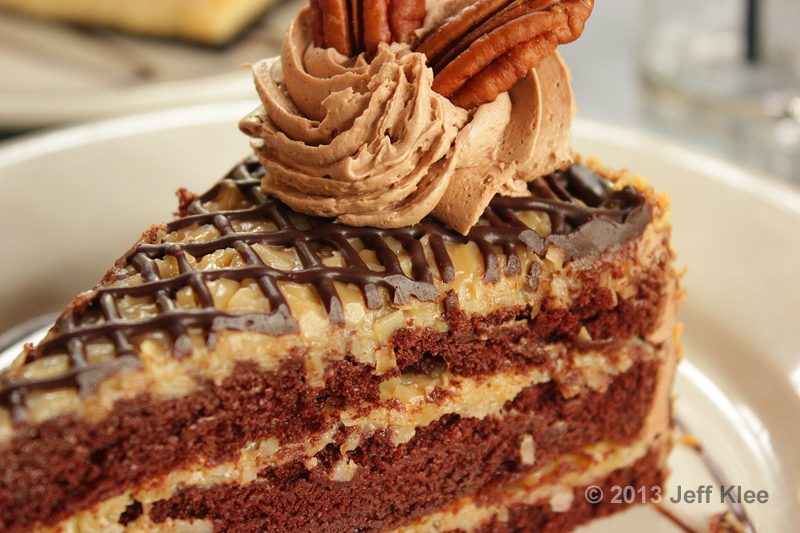 Again, I’m not fond of nuts in my desserts, but there are times like this where it can work. While the almonds were not necessary to please my taste buds, they didn’t make me dislike the cookie. Overall it was soft, but needed a little biting action to break into. For a quick bite, they were enjoyable, just not something I’d order as my primary post-meal snack. 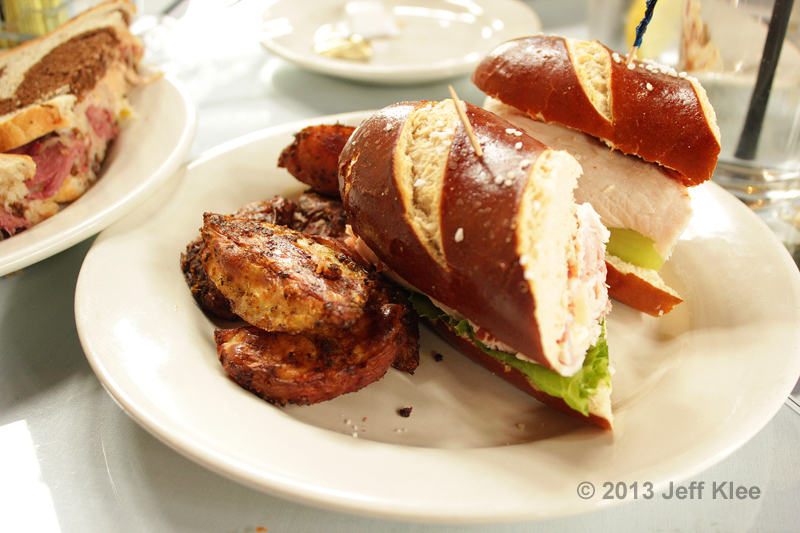 My first visit to City Cafe for a meal was a positive experience. My sandwiches, while not unique, appeared to have very fresh ingredients, and the side item I wasn’t expecting was a bonus. The desserts, as always, were excellent for the most part. I’m excited for my future visits and having the opportunity to try all the food, especially items that I would normally skip while running for my known favorites.